*This article is part of a weekly Throwback Thursday series that will feature key stat lines and short recaps of the last time the New England Patriots played their upcoming opponent. New England Patriots’ fans love to reminisce and Atlanta Falcons fans would love to forget, but this week’s Throwback Thursday piece belongs to the historic and epic comeback that the Patriots pulled off to win Super Bowl LI. Last time out, New England found themselves in a 28-3 deficit midway through the third quarter of Super Bowl LI before scoring 31 unanswered points, including the game-winning touchdown in overtime, to defeat Atlanta 34-28 and bring home their fifth championship. No team had ever made up for than a 10-point deficit to win a Super Bowl until then. This was the first-ever overtime in the Super Bowl’s 51-year history. Brady led the Patriots on five straight scoring drives to equal their 31 unanswered points. The Patriots’ quarterback set a number of Super Bowl records that night, including the most Super Bowl rings (5), most pass attempts (62), most completions (43), most passing yards (466), fourth Super Bowl MVP, first quarterback with three Super Bowl fourth-quarter comebacks and the most game-winning drives in the postseason with 10. James White broke a few records himself, as he totaled 14 catches (most all-time) and became the first player with three touchdowns in a Super Bowl since Terrell Davis in Super Bowl XXXII. White also broke the record for the most individual points scored (20). The Patriots trailed 28-12 with 8:31 left in the fourth quarter, and Atlanta was facing a third-and-one at its own 31-yard line, when defensive captain Dont’a Hightower made one of the most pivotal plays of that championship game. Hightower’s strip sack on Falcons’ quarterback Matt Ryan allowed Alan Branch to fall on the ball to give New England the ball back, the momentum back and the game back. Julian Edelman also gave us a play to remember. 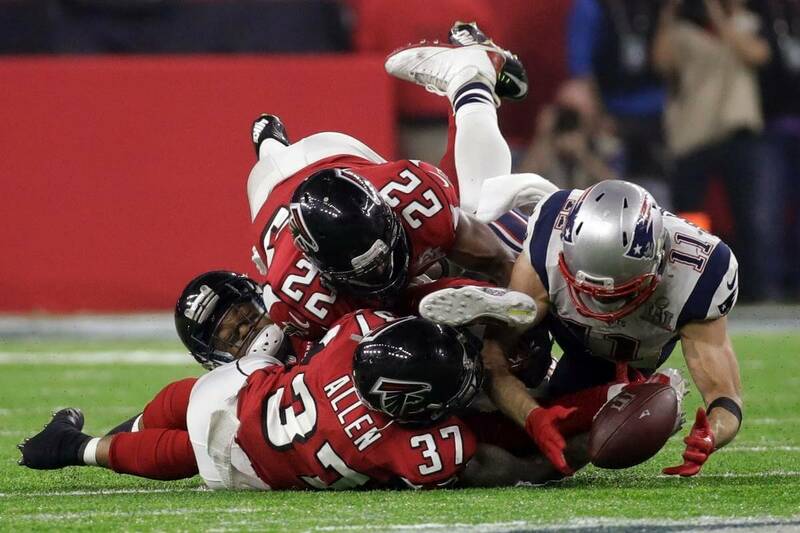 The Patriots still trailed by eight points, when Edelman and Atlanta cornerback Robert Alford were battling for a ball that bounced off Alford’s knee and shin. Edelman was able to get his hands underneath the ball, just mere inches from the ground. The catch was good for 23 yards and a first down at the Atlanta 41 with 2:03 left. Tom Brady went 43-of-62 for 466 yards, two touchdowns and one interception, while Matt Ryan tallied 17-of-23 for 284 yards and two touchdowns. LeGarrette Blount had 11 carries for 31 yards, while James White had six rushes for 29 yards and two rushing touchdowns. For Atlanta, Devonta Freeman had 11 carries, 75 yards and one touchdown. On the Patriots’ receiving side, James White led the way with 14 catches, 110 yards and one receiving touchdown. White caught 14 of his 16 targets and also scored one of the team’s two two-point conversions. Julian Edelman had five catches for 87 yards, including his all-important 23-yard, first down, shoe grab near the end of the fourth quarter. Danny Amendola caught eight balls for 78 yards, a touchdown and the second of New England’s two-point conversions. For Atlanta, it was Julio Jones who racked up 87 yards on four receptions. Austin Hooper and Tevin Coleman recorded a touchdown each on the night. New England’s defensive efforts were led by Trey Flowers who accumulated six total tackles and 2.5 sacks on the night. Alan Branch, Jabaal Sheard and Kyle Van Noy all posted a half sack each; and Dont’a Hightower recorded one sack – his momentum-changing strip sack. Keanu Neal led the way for the Falcons, racking up 13 total tackles. Grady Jarrett tallied three sacks on the night, including 3.5 tackles for losses, while Dwight Freeney and Courtney Upshaw recorded one sack each. Robert Alford completed an 82-yard pick-six against Brady late in the second quarter. The Atlanta Falcons will make the trip up to Foxborough for a rematch against the New England Patriots this Sunday night. Game time is set for 8:30pm from Gillette Stadium.